Outside of swimming, building sandcastles, playing volleyball and perhaps people watching, reading a trashy paperback novel is one of the great joys of lying on the beach. But what happens when you decide that it's time to go all twenty-first century, abandon the "dead tree" (i.e., paper) books and embrace e-books? The beach represents a bit of a wrinkle in your plans, does it not? The good news is, there are options. While it used to be rare, more and more e-readers are showing up at the beach these days, as well as beside swimming pools and other locations that are generally considered to be unfriendly to electronics. 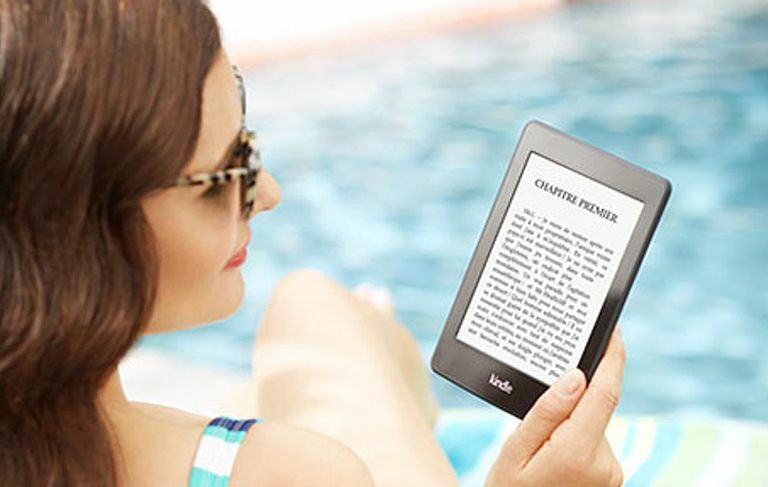 Choosing the right e-reader is key to enjoying your beach e-book experience. This is one of the big advantages of e-readers such as the Kindle Paperwhite on tablets like the iPad. You go to the beach at least partially because it's hot and sunny. Hot weather doesn't bother most e-readers (at least so long as you're in sub-Saharan temperatures), but sunlight is the mortal enemy of devices with LCD displays. First of all, the brightness of the sunlight is all but impossible to overcome, so that screen that seemed so vivid in the hotel room will be so washed out you'll barely be able to see it. Adding insult to injury, LCD displays are prone to glare as well. Sure, if you squint and shade the display with an umbrella, you may be able to struggle through a chapter or two before giving up, but that's work and work is the last thing you want to do while relaxing by the ocean. So leave tablets, smartphones and LCD display e-readers off the beach-friendly list. That means no iPad, Nexus, Surface or Kindle Fire among others. Thankfully, most dedicated e-readers today have caught on, and you can find great e-ink Nook and Kobo e-readers in addition to the Kindle options. Are you expecting occasional day trips to the surf, or could you be going to a resort for a week or more at a time? Power is another strike against anything with an LCD display unless you want to be dragging a charger around with you and plugging the device in each night. An E Ink-based e-reader like a Kindle, Kobo, or NOOK will last anywhere from ten days to a month on a single charge, so you don't need to pack a charger. Less chance of being left with a blank screen in the middle of a hot day, one less thing to pack and one less thing to worry about forgetting when it's time to go home. After pointing out that sunlight and power requirements pretty much eliminate tablets and e-readers with LCD displays, we're left with E Ink based e-readers at this point. Now is the time to start splitting hairs and determining personal preferences, beginning with spontaneity. Are you the type of person who packs all the books they need and sticks to the titles in the beach bag? Or do you fall prey to the bestseller racks at the convenience store when you pop in for a soda? If you're content to read what you have on hand, then being able to buy or download titles wirelessly shouldn't be an issue, and any of the mainstream e-readers should be in the running. But if you want the ability to be relaxing on a lounger, decide that no e-books you have on your device appeal to you today and two minutes later have something from the New York Times Bestseller List downloaded and ready to read, then you need a cellular capable e-reader and that means a one of the various Kindle models with included cellular connectivity. Interestingly enough, Amazon includes cellular service for free with the purchase of several capable Kindle models, including the Paperwhite and the Oasis. There aren't any really large e-readers anymore, and it makes sense too. When you're carting your stuff to the beach, every ounce counts and regardless of any other advantages they might have, these to king-sized e-readers were not ideal beach candidates. If you're looking to go as compact as possible, you can easily find 6 inch e-readers to get the job done. The Kindle Paperwhite is once again a perfect example. Generally, e-readers range from the 6" mark up to 8" on higher end models. The market has matured enough to select that range as the "sweet spot" and it holds true in most, if not all, situations. No matter how careful you are, there is always a chance that a rogue wave or carelessly thrown frisbee might reach your general vicinity. In the days of the paperback, this might have meant a water-soaked and warped (but still readable) book. An e-reader is much more delicate, however, and any accidental abuse might result in a dead device. Not to mention the fact that an e-reader is a little more valuable than your average trashy paperback and might be a tempting theft target, especially if you leave it unguarded while you go in for a dip. If you can afford a replacement in a worst case scenario, then you can skip this section. If having to replace your e-reader could leave you without one for months while you save up, then you might want to consider a low-cost option. Right now, the base Kindle leads the value side of the equation, coming in at $79.99. It's best to avoid more expensive options like the $249.99 Kindle Oasis. If buying or downloading books on a whim is important, then the Kindle Paperwhite is a good option. If you want the most compact e-reader possible, any of the 6" options, like the Kindle Paperwhite, Kobo Clara, and NOOK GlowLight, is a solid pick. If you're worried about loss or damage and replacement costs, go for an entry-level Kindle which is currently among the least expensive options out there. If water is your chief concern, you can always go with a waterproof option like the Kindle Oasis or the Kobo Aura H20. Whatever model e-reader you choose, you can minimize the potential for damage by investing in a water and sand resistant cover like the one shown in the image. They may cut down on the sleek look of your e-reader a little, but you can remove the cover once you're away from the hazard zone and it's inexpensive insurance. Or, go the Jeff Bezos route and use a Ziploc bag. Is an E-Paper Smartwatch Right for You?